"I feel fabulous. 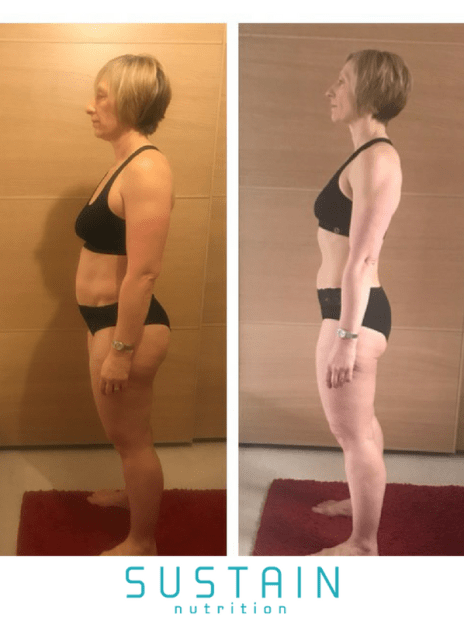 I love feeling happy in my own skin again (and the white jeans I promised myself I’d get into) Sustain is a real game changer - thank you"
‘I, like many people, had really over indulged over the Christmas period (and during the run up!) and I actually could not wait to start Sustain. I go to the gym at least five times a week but I certainly didn’t look like it! It is so true that you can’t out train a poor diet (too much booze!). I found the plan easy to follow and the accountability was really useful. Knowing that I had to share my food diary with my coach every day really helped me to stay focused. The group posts and daily emails also helped enormously – supportive and thought-provoking. Practically ever single topic resonated with me on some level.